Studies have shown that time spent outside is beneficial to mental and physical well being – in a number of different ways. In adults, depression rates decrease with outdoor physical activity and prolonged exposure to vitamin D. Children who live a more active lifestyle, as compared to a sedentary one, consistently test higher in reading comprehension and math skills. Additionally, outdoor play exposes children to sunlight, fresh air, and natural elements, which in turn benefits the immune system, contributes to healthy bone development, and encourages a lifetime of physical activity. And these are just a few of the reported benefits! In the summer, Vancouver offers an abundance of opportunity to reap the health benefits of being outside. As the days get longer and the weather gets warmer, Vancouverites emerge from our winter hibernation and begin to enjoy the numerous beaches, mountains, plazas, patios, walkable neighbourhoods, and world class parks that our city has to offer. Yet in the winter, opportunities to enjoy the health benefits of being outdoors are often constrained by our need to be shielded from the elements. Cold, wet winters tend to drive people indoors, which has the add-on effect of removing us from a lot of the opportunities for outdoor social interaction that we get during the summer months. Outdoor physical activity also declines — and this, in combination with other factors (like the lack of sun), increases the likelihood of seasonal affective disorder and the winter blues. Of course, none of this is helped by the fact that many of our public spaces seem poorly designed for the rainy months. Aware of the impact of winter on public life, designers, advocates and community groups have all recommended strategies to activate public spaces to encourage people to get outside on rainy days. In Vancouver, popular mid-winter activities like the Lumiere Festival the Christmas Market, and the Polar Bear Swim exist entirely outdoors, but only for a brief period of time. But what about deliberately designing permanently weather-proofed outdoor spaces to encourage continual physical and mental well being during the winter months? Among other examples that can be found from around the world, two recent ones from Toronto and New York City offer some ideas on how to design weather-proofed public spaces for the benefit of all. Recently opened to the public in January 2018, the Bentway is a covered public trail and corridor space underneath the Gardiner Expressway. Spanning six Toronto neighbourhoods, a total of 70,000 residents live within proximity of this active recreational area. The design by Ken Greenberg and Public Work specifically considers families with children and seniors, and emphasizes winter activities in its programming. Since opening, the main attraction has been the ice skating trail, a figure-eight shaped sheet of ice which is host to ice breaking workshops and skate parties. 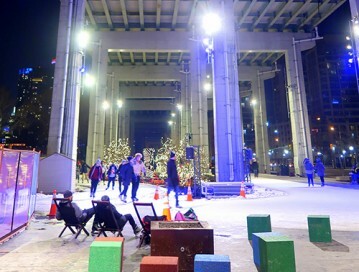 In addition to the rink, visitors also find warming stations, a dog play area, rotating public art and light installations, and a fitness area shielded by the nearly 5 story high, cathedral-like concrete form of the overhead expressway. In the summer, the skate trail will convert into a walking and rollerblading space with room for public markets, film screenings, an urban amphitheatre, and community gatherings. While we have one skate park and one playground located under bridges – the Bentway example highlights other possibilities for these covered areas. It raises a good question: how might we use other “under bridge” areas in Vancouver?. In an effort to foster an active lifestyle among a diverse population, NYC has been investing in the year-round programming of community parks. 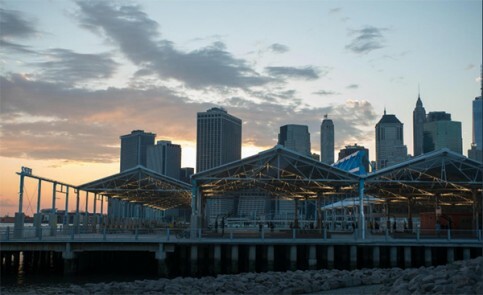 The Brooklyn Bridge Park, opened in 2010, is an 85-acre post-industrial space on the Brooklyn side of the East River. Pier 2, one of six five-acre piers within the park, is dedicated to year-round active recreation. Protected from rain and snow by the roof of a former warehouse, visitors to the park can make uses of five fully accessible and covered basketball courts, fitness equipment, children’s play areas with seating for parents, handball and bocce courts, and shuffleboard. A roller rink, complete with live DJ, is equipped for in-line skating, roller derby, and roller hockey. In addition to these activities, the park hosts winter walking tours, with subjects ranging from history to horticulture. Outdoor public BBQs, picnic tables and lounge areas are available year round, with a spectacular view of Brooklyn Bridge and downtown Manhattan. The adaptive re-use of these old industrial buildings – and even just the presence of a canopy – makes all the difference here. Another example of something we might also consider in Vancouver. Designing urban public spaces that invites a diverse group of people to spend time outdoors year round can improve inclusiveness, limit social isolation, and foster a greater sense of emotional and physical wellbeing through the benefits of active recreation. With a little imagination, Vancouverites could reap the rewards of deliberately designed outdoor recreational spaces that shield from rain while offering engaging places for children to play, seniors to gather, and communities to come together. Do you have examples of good rain-friendly public spaces that you’d care to share? Drop us a line and let us know. And while you’re at it, stay-tuned for more on our upcoming Life Between Umbrellas Design Ideas Competition. Jada Stevens lives downtown and can be found enjoying Vancouver’s public spaces year round. Among her favourite spots are the beaches and trails of Stanley Park, and the many fantastic people-viewing vistas of Robson Square.